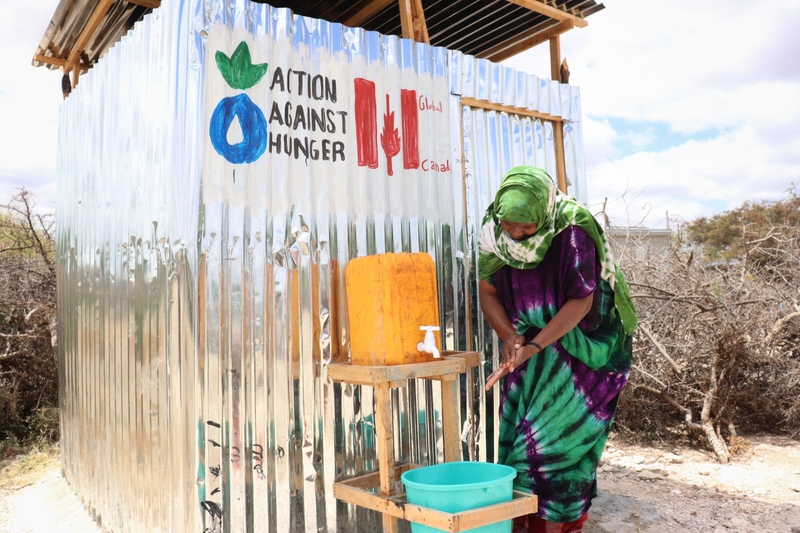 Photo: A woman washes her hand at a latrine built with support from Global Affairs Canada. Photo by Fardosa Hussein for Action Against Hunger, Somalia. To wrap up this year’s International Development Week, we chose some of our favourite photos that celebrate how Canadian aid is making a difference around the world. These photos inspire us to find a better way to fight hunger around the world. These year in photos keep us #DevInspired! Photo: Clementine, 45, and Benjamin, 41, are community health volunteers in West Pokot, Kenya. They trained together, and they still like to team up. They go from home to home, finding support in each other to double check cases of malnutrition. They walk long distances, crossing the hills of North Pokot to reach the scattered families in their area. Photo by Lys Arango for Action Against Hunger, Kenya. Photo: 2018 marked another devastating year of conflict in Yemen — causing what the United Nations has called the world’s worst humanitarian crisis. Despite restricted access for aid workers, our teams reached hundreds of thousands of people in Yemen last year. We run vital nutrition and health programs in Aden, Hodeida, and Hajjah. Photo by Action Against Hunger, Yemen. Our emergency response team met Hasan, a 34-year-old father of five, in a small, hand-built shack in Al-Garrahi. He is one of many displaced by the ravages of war in Yemen, trying to regain some semblance of a normal life. The conflict has caused an extreme shortage of affordable food, fuel, and medicines. Health centres lack resources and lose power frequently, too often resulting in tragedy. Photo: Dr. Maryam Abouacar, 38, has treated 4,500 cases of acute malnutrition in just the last two years in Mayahi Rehabilitation Centre. Niger’s Maradi region is one of the hardest hit by drought and food insecurity. Using a holistic approach to treatment, Maryam helps children not just survive, but thrive. Photo by Lys Arango for Action Against Hunger, Niger. These four words made a big impact on the psychologist: “I saw in him the desire to live and I understood that the fight does not end until the last second,” she says. In this photograph, Maryam smiles at three babies recovering from acute malnutrition. The triplets’ mom is Aisha, a woman who was forced to beg so that her children could survive. Maryam met them on market day, and saw that the babies’ lives were in grave danger. She immediately referred them to the hospital and then worked for weeks to help the children recover not only their nutritional status, but also their psychomotor development. Photo: In August 2017, hundreds of thousands of Rohingya people fled persecution and violence in Myanmar, seeking safety across the border in Bangladesh. Traumatized and malnourished, he newly displaced men, women, and children joined 200,000 additional Rohingya people already living in Bangladesh, who had been displaced by violence in previous years. Photo by Gonzalo Höhr for Action Against Hunger, Bangladesh. In 2018, the threat of monsoon season loomed large — many of the temporary shelters are built in low-lying, deforested areas that face a high risk of flooding and landslides. At the same time, overcrowding, poverty, lack of access to resources, and poor sanitary conditions all contributed to the spread of diseases such as diarrhea, dysentery, respiratory illness, and malnutrition. Photo: In Hudur, Southwest Somalia, Luley works in her garden – she keeps some of the produce she grows for her family and sells the rest for additional income. Photo by Fardosa Hussein for Action Against Hunger, Somalia. Hudur was heavily impacted by the state of “pre-famine” declared in 2017. Prolonged drought and conflict have killed off many livestock in recent years — causing vulnerable communities that are dependent on herding to lose their sources of income. Photo: “Livestock is our family. If we have water, we share it with them. If we lose our cows, we lose our prestige, our essence,” says Malick Abdud, participant in one of Action Against Hunger’s food distributions in Podor, Senegal. Photo by Lys Arango for Action Against Hunger, Senegal. Photo: María Josefina Roque, 30, is a pioneer in her community, La Ceiba Talquezal, in Chiquimula, Guatemala. María grew up in a culture dominated by machismo and deep-seated patriarchy. A single mother of four, María Josefina now serves as secretary of her local seed bank, an Action Against Hunger project that aims to promote diet diversity and stabilize food prices. Photo by Lys Arango for Action Against Hunger, Guatemala. Photo: For nine years, the conflict between the Nigerian government and local insurgency groups has been tearing apart Northeast Nigeria. More than two million have been displaced in Adawama, Yobe, and Borno. Resources are scarce, and much of the population relies on humanitarian aid to survive. Photo by Sébastien Duijndam for Action Against Hunger, Nigeria. Beyond the more tangible benefits, the Porridge Moms have found comfort, emotional support, and comradery with each other. Many have been through trauma to escape conflict — the mothers groups are a way for them to share their experiences in a safe place. Photo: Forget paved roads. Our teams in South Sudan just hope for dry land on some days! One of Action Against Hunger’s newer bases in the world’s youngest nation takes many hours to reach: by plane, truck, boat, and eventually just two feet. But our staff doesn’t hesitate to go the distance. Photo by Action Against Hunger, South Sudan. Here, Sulaiman, Head of Logistics in South Sudan, shows what it takes to get supplies — including everything from building materials for health centers to boxes of lifesaving treatment — to the hard-to-reach communities we serve. “This is the best part of my job…on my way to serve humanity,” says Sulaiman.